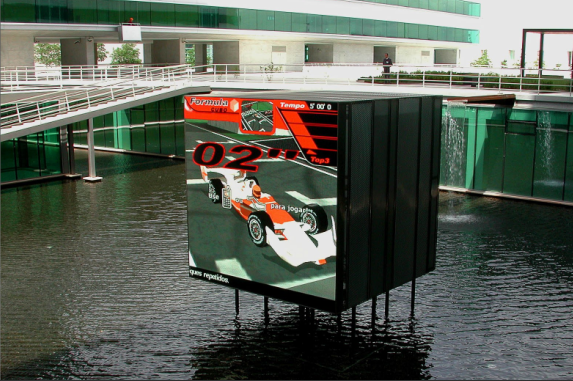 In 2002, Vodafone gave their Lisbon HQ a face-lift; the refurbished space was to be dominated by a striking Cube, suspended over an artificial lake. From the start the Cube was conceived to become a ground-breaking installation, which called for smart and interactive content made to entertain and captivate Vodafone visitors and employees. YDreams and IDEO developed the Cube”s 4 x 4 m interactive display, featuring a range of applications including pioneering multiplayer games that visitors and passers-by controlled using their mobile phones. The Vodafone Cube installation also won a Gold Award at the 2004 edition of IDEA (Industrial Design Excellence Awards). Position:Software Developer for the games applications.